The semi-finalists are set for Trinity College School’s House Debates program, following the fourth and final preliminary round of debate on Friday, February 8th. In a surprising twist, Orchard, Ketchum, Rigby and Scott will compete in the semi-finals at both the Junior and Senior levels! In Friday’s debates, Junior teams took part in a researched debate on the resolution that “all secondary schools should be co-educational.” The top individual was Neyha Billing of Rigby House, followed by her Rigby teammate Jasleen Billing in second place. In third spot was Ashley Hayley of Ketchum House. Neyha and Jasleen comprised the top team, followed by Ashley and her Ketchum House teammate Clare Scholfield. In third place was the Scott House pairing of Annie Honkoop and Ellie Podunovich. The top Junior houses in the round were Burns, Rigby, Orchard and Scott, each with one win and one tie. 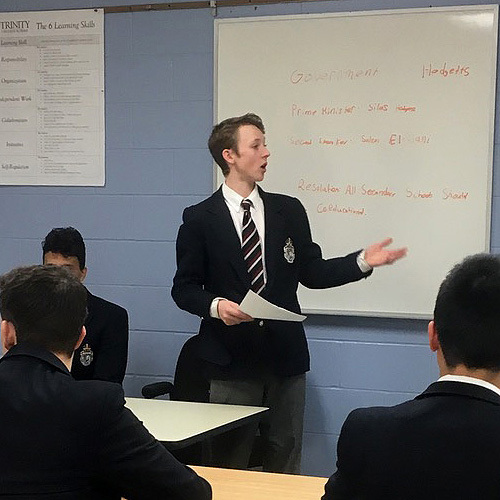 The fourth round of Senior debate was held in the impromptu format, with teams learning the resolution – that “all we really need to know, we learned in kindergarten” – just minutes before the debates began. Orchard’s Ben Traugott took top spot overall, followed by a second-place tie between Nicky Golding of Ketchum House and Scott’s Julia Jenkins. Ben also took top team honours with his partner, Tenzin Mahabir. Nicky and her Ketchum House teammate Olivia Pattison stood in second place and the Scott pairing of Shreya Langhe and Zororo Mutomba rounded out the leaderboard in third place. Rigby, Orchard and Ketchum had the top results in the Senior division, with two wins each in the round. Overall, Orchard and Rigby House had the best records of the day with a total of three wins and one tie each. Orchard and Rigby will meet Ketchum and Scott in the Senior and Junior semi-finals set for Monday, February 25th during afternoon flex block. View the House Debates Rd IV ’19 gallery for more photos.